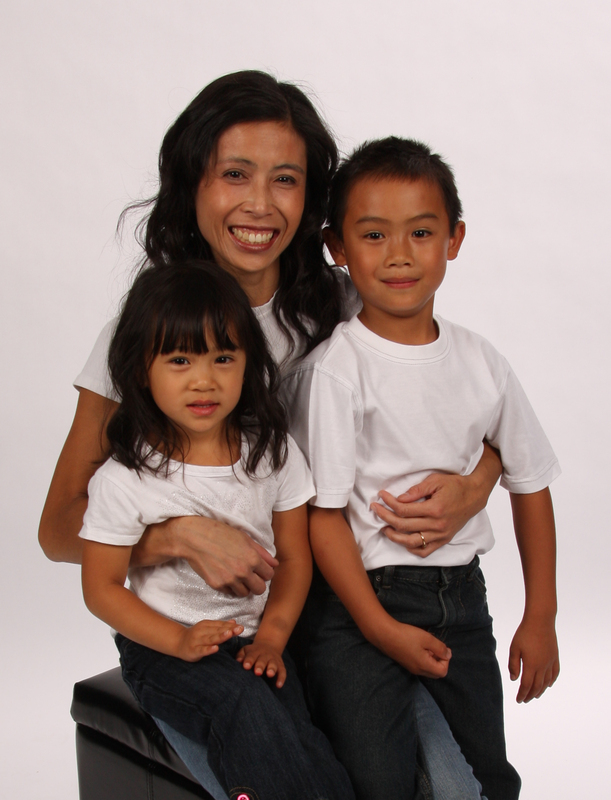 I am a full-time physician at Jean Talon and Lachine Hospitals, as well as being a full-time, single mom to 2 wonderful children: Justin Tyler, age 9, and Jessie Anh, age 6. The advantage of my job is that I can pretty much make my own hours. Who else gets to work from 9:15 to 2:30 everyday? This way, I get be a part of every step in my kids’s lives! They grow up so fast! Time management is essential. Always plan ahead! Prepare everything in advance and get the kids to help. Prepare breakfast and lunches the night before. Lay out all the clothes for the next morning before you go to sleep. Prepare the next day’s supper after the kids are asleep. That way, mornings are less rushed and you get to spend more quality time after school. No toy, object or gadget can replace the quality time spent with your kids. In twenty years, those memories are what they will cherish. They will have completely forgotten the material things. Managing to hold a successful birthday party for my daughter’s 6th birthday, after all 12 kids accepted the invite! And all the moms dropped off their kids except for one! Hosting a Halloween party for ten 7-year-old boys, with no entertainment planned and only one mom to help! All the weapons in the house had to be confiscated and the boys still managed to injure one another! A happy mom makes for happy children, so always make sure to take some time for you. Reading bedtime stories to my kids at night and the 10 minute conversations with them after lights-out. Yes, balance does exist, but only with compromise. It is impossible to be a perfect mom, wife, housekeeper, cook, etc, as well as be perfect at your job. Sacrifice perfection for quality time with your kids. I’m not sure I have a guardian angel, but I am very grateful for my cleaning lady, who does all the chores that I despise and that would take me hours to do. My silly kids make me laugh out loud everyday, especially Jessie, with her funny faces! ALWAYS strive to be the best that you can be and never settle for any less. 2. My Kitchenaid hand mixer: It allows me to purée vegetables (cauliflower, carrots, broccoli, peppers) and sneak them into my kids’ meals (spaghetti sauce, omelettes, cauliflower in mashed potatoes, zucchini in muffins, etc. Until recently, they never even knew how many veggies they were eating! 3. Entertainment Book: This book has great coupons (50% off, 2-for-1deals) for restaurants (Subway, Burger King, Pasta Tutti Di Giorni, Barbie’s, sushi, Dairy Queen, etc), movies (Guzzo), ski tickets, hotels (ex: $15 off Hotwire price), car rentals, amusement centers (Fundomundo, Jungle Adventure) and local attractions (Biodome, Science Center, Insectarium, etc). It saves me lots of money every year! 4. Montreal Families Weekend Guide: Sign up on the web page (Montrealfamilies.ca) and they send you weekly emails about all the weekend activities all over Montreal, Laval and the south shore. This includes fairs, plays, festivals, amusement parks at the malls, etc. It’s really great for planning your weekend with the kids! 5. Secrets of the Baby Whisperer, by Tracy Hogg: Yes, my kids are older now and sleep through the night, but for those moms with infants, this book is a must-read (if you value your sleep!). 6. The Internet: Need a practice math test for your 9-year-old? Need to research a project for Grade 3? Need a times tables speed test for your son? Need an idea of what to buy your teacher? Not sure if your kids are getting enough milk? Want top know when March Break is in 2014? Well, you can find it all on the Internet! 7. The Children’s Place outlet store (Montreal and in the U.S.A): Where else can you buy an entire wardrobe for your child for so little? Register your email address with them and get coupons for 15-20% extra. Jeans for under $10, $2-$5 T-shirts, $0.50 socks, winter down jackets for $25, spring jackets for $12. Look for the deals….especially off-season. 8. Resorts with water parks, waterslides and great Kids Clubs: Since my daughter turned 5, we have been going to resorts down south with great waterslides and a neat Kid’s Club. This allows parents to actually relax and have a REAL vacation and the kids have a blast! Examples of some good resorts are: Barcelo Maya Colonial (Riviera Maya), Barcelo Punta Cana, Beaches Turks and Caicos, Gran Real Caribe (Cancun), Coconut Bay Resort (Saint Lucia) and many others that can be found on the Internet!